Gain insight into illumination from early Celtic to modern day while producing your own interpretation of these richly decorated letters or design a monogram. 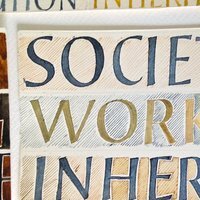 Learn how to design, draw, paint your letters and embellish using simple gilding techniques. This course will give an overview of the various historical styles of illumination from early Celtic to modern day. The main emphasis though will be on the practical work of designing, drawing and painting letters using colour and simple gilding techniques with a session on designing a monogram. It is Ideal for those already practicing calligraphy, or those with a love of the richness of colour and gold, who are attracted to the wonderful world of decorated letters. 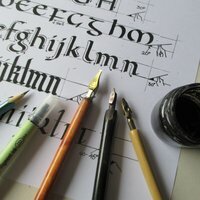 The course is suitable for calligraphers or those who enjoy detail and some precision. The tutor will give group demonstrations; give encouragement and advice on a one-to-one basis, with plenty of time for practical work. Examples of good designs by a range of artists will also shown. Residential students to arrive from 4pm, non-residential students to arrive by 6.45pm. 6.45pm: Welcome, followed by dinner (included). 8 - 9pm: First teaching session, attendance is essential. Classes 9.15 - 5pm, lunch is included. From 6.30pm: Dinner (included for residential students). Evening working - students may have access to workshops, but only with their tutor's permission and provided any health and safety guidelines are observed. Classes 9.15am - 3pm, lunch is included. Residential students are to vacate their rooms by 10am please. Some quality cartridge paper and layout paper to share amongst the group during the course. 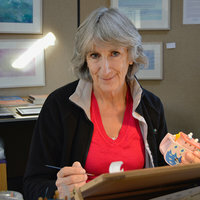 Patricia has been working to commission and teaching the calligraphy and associated skills since 1984. She trained with Ann Camp at Roehampton Institute of Further Education. She was elected a Fellow of the Society of Scribes and Illuminators in 1998. 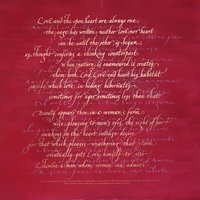 Her work was included in The Calligrapher's Project Book and Practical Calligraphy (Hamlyn 1991). Residential option available. Find out accommodation costs and how to book here.